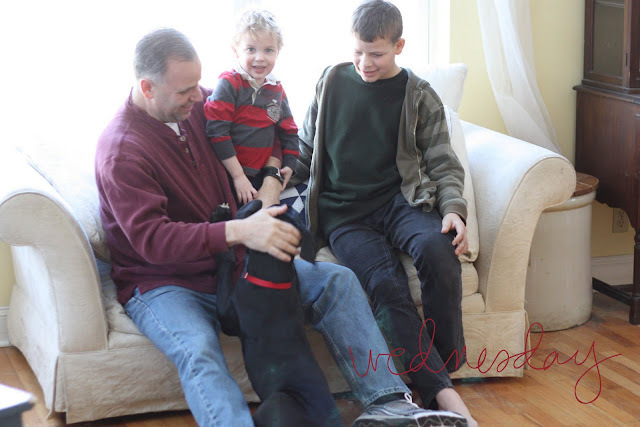 Here's this week's installment of photos for my "Project Life" album. The basic concept is to document a year of living, one photo, one day at a time. I don't strictly adhere to a photo a day... some weeks I use photos as fillers or even use more than one photo from a day. I'm totally ok with that. I'm also totally ok with blurry photos and imperfect shots. It's life. Totally rich to me. My kitchen. We've been out in our kitchen addition for a little over a year. I *love* my kitchen. It truly is the heart of our home. It's where we mostly hang out as a family and when we have friends over (which we love to do with great regularity) the kitchen seems to always end up being the hangout spot. I'm planning a blog post in the near future to take you on a tour of our farmhouse kitchen. Josh. 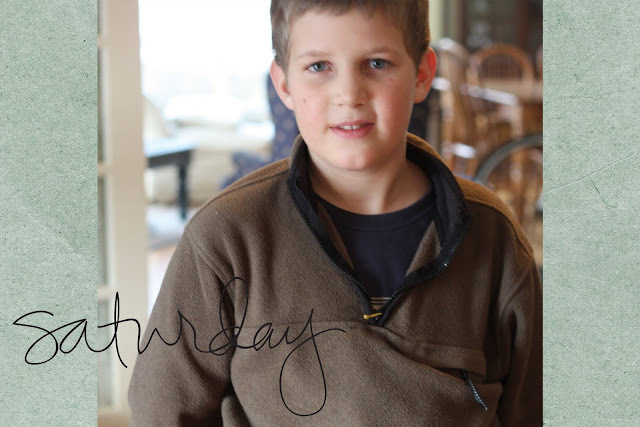 At 10 already becoming a man in his tenderhearted passion for the Lord and for all things "boy." He is one of my celiacs... thus the gluten free recipes you'll find on my blog. Valentines Day. 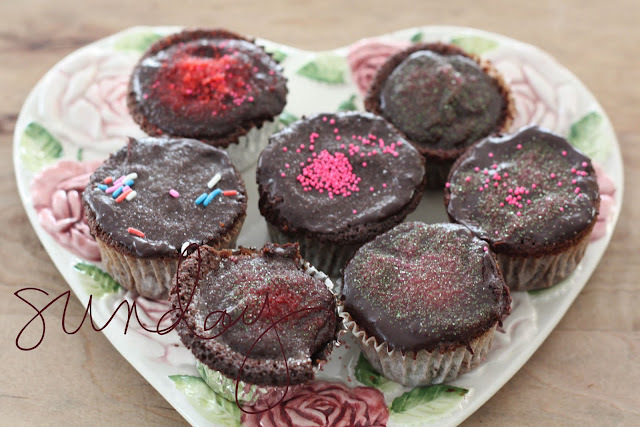 The children had a blast decorating chocolate (gluten free, of course) cupcakes this year. Unfortunately I forgot to take a picture before the cutest ones were gobbled up. Do you like my pretty heart-shaped plate? I found a matching set at a favorite thrift store for $2! Pretty fun! What can I say about this? 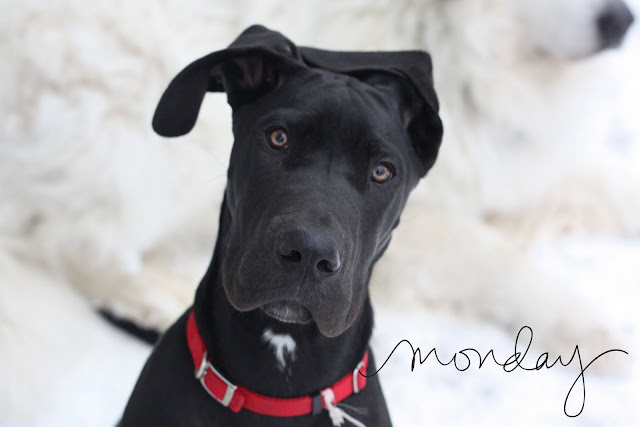 4 month old Great Dane puppies are just plain cute. He frequently has the "wonky ear thing" going on. "Food?" says Dude. "Did someone mention food?" Focus on the Family's radio theater production of "The Chronicles of Narnia" are a favorite winter pastime here. The boys were totally engrossed in listening when I captured this shot. Well, Tim wasn't. He always seems to know when I pick up my camera. Captured a silly tickle session. Dude (the puppy) wanted in on the action. Miss Hannah coming in from a walk on our property. At 17, she is a total delight to have around. I *love* having teens in the house! There you have it... another week zipped by. 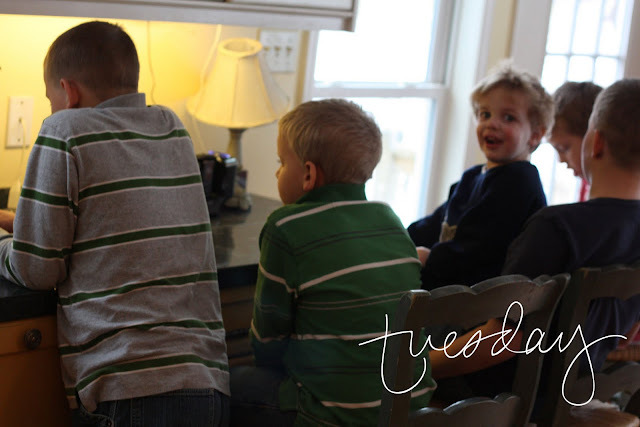 Check out Jessica's blog The Mom Creative to see what others are doing with their Project Life albums. Thanks Jessica for hosting! love, love, LOVE your kitchen--especially that sink! and that last picture of, i'm guessing, your daughter looks like something straight out of sense and sensibility--i love it! Susanne, Thanks! I *love* my old farmhouse sink... as I mentioned, I'm going to try to give a tour of my farmhouse kitchen later this week... stay tuned! Yes, Miss Hannah is my daughter... oldest at home. 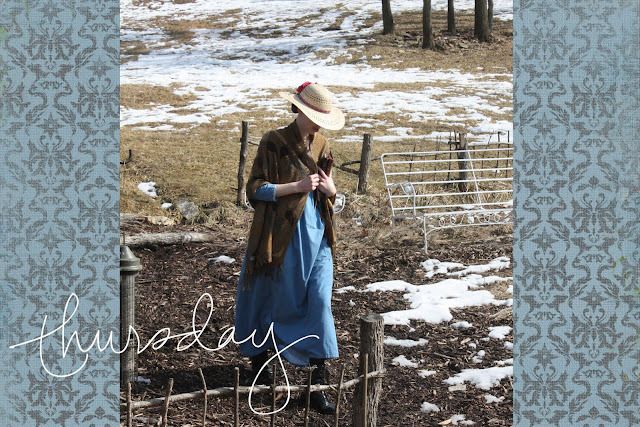 She loves sewing Pride and Prejudice era clothing~ I love seeing her wear them! Your blog is definitely one of my favs concerning the Project Life photos. They are always just lovely. 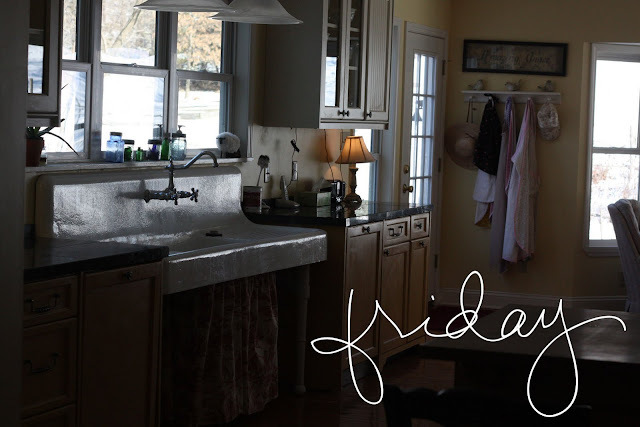 Your kitchen is fab, and I love all the photos of your gorgeous kiddos! I LOVE your kitchen! Can't wait for the tour! Even though I'm not a dog person, I love that picture of your dog! that is the cutest canine pic I've ever seen!!! You could win a photo contest with that one! Beautiful photos! Beautiful glimpse into your life! Love all your pictures they have such a comfy warm feeling to them. Can't wait to see the rest of your kitchen, I love the sink. You have a beautiful family. So many people to love, laugh with and live with. It must be crazy and wonderful all at once. Enjoy your week. Renee, Dawn and Busymom, Thanks so much for your kind and encouraging comments! You guys really do make my day when you take the time to leave such sweet little notes on my posts~ Thanks! And Dawn, it *is* crazy and wonderful all at once! Keeps me humble and helps me sleep well at night too! LOL! Can't wait to try those gluten free meatballs and meatballs! Thanks Cinnamon! I've had fun looking at your blog too. Do you have a Celiac in your family as well? I noticed you mentioned a GF recipe that you were making. Just curious. As always, thanks *so* much for the encouraging comments here! I am thoroughly enjoying these posts Susan. I agree with you, blurry photos make it all seem more "real" somehow! How can life not be real??? You captured some lovely moments this past week. I *love* the idea of taking a tour in your kitchen. How fun that it is an addition...what I have seen of it is absolutely lovely. Funny ~ we have been listening to the Narnia series too (for about the third or fourth time) ~ we even were listening tonight. What a great shot of your engrossed young men. Have a wonderful evening my friend! We are Pride and Prejudice fans around here, too. I always enjoy seeing a glimpse of your life! Abby is one of my Celiac girls and one of the best bakers. Can't wait to see your kitchen! I am really looking forward to the "full-post" as...we are "trying" to finish our kitchen and it yes, is always the "gathering place"! :) Wondering what & where to put our Big family table? We have two choices...my question(s) where do yall school, sew, family area? I believe you had posted your living room was now the sewing? Well...not to add too much pressure, "PLEASE" post your tour & added helpful hints---soon! Camille, Susan and Lori, thanks! I'm having fun planning my virtual kitchen 'open house!' lol! And Lori, I will try to include what we are doing for sewing, homeschool and dining as well~ perhaps I can do that one next week! we have food allergies of some sort and we've found that dairy and wheat are very bothersome to us. One of my children is being tested for food allergies next week. Which is great because then I won't have to be poked because he and I are the same. So if he has a food allergy to something then most likely I do too. We just made GF Chicken Apple patties they were really yummy! !